Flint, Mich. — A community school model now in place at five elementary schools will expand to all 11 schools in the Flint Community Schools (FCS) district by the start of the 2016–17 school year. In addition to helping students to meet academic goals, the model also aims to help schools connect students and families with the resources and services they may need in the wake of Flint’s water crisis. The Charles Stewart Mott Foundation will award a $2.9 million grant to the Crim Fitness Foundation to support the expansion. Crim serves as the lead agency coordinating community school efforts. 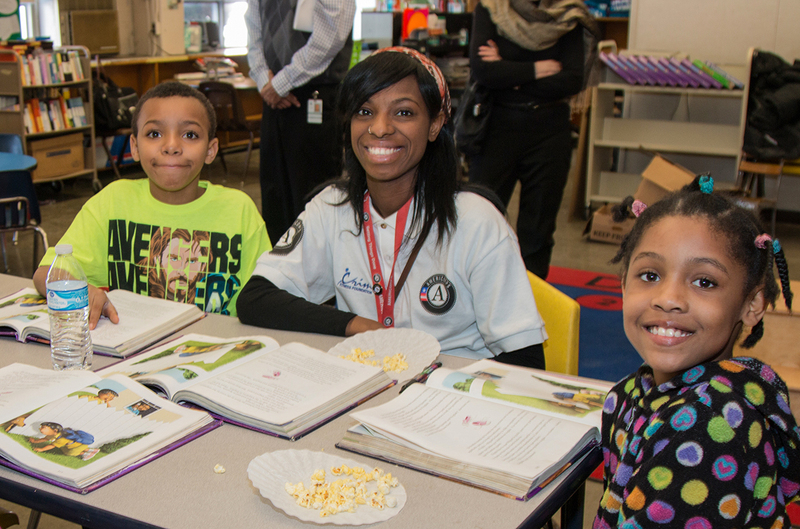 The community school program at Flint’s Potter Elementary is engaging AmeriCorps members to help strengthen students’ reading skills. Flint has long been known for its leadership in the community school movement. In 1935, C.S. Mott and Flint educator Frank J. Manley launched a “lighted schoolhouse” model, which made use of school buildings during non-school hours to provide educational and recreational programs for students, families and neighborhood residents. This helped to shape the development of a school-based model of community education that eventually spread throughout the country and around the world. As part of Flint’s master planning process in 2013, residents identified a new model of community schools for the 21st century as one of their top desires. In response, the city, FCS, Mott, Crim, the United Way and other community partners teamed up to pilot a new model at the Brownell and Holmes STEM Academies in the 2014–2015 school year. The model was expanded to three more elementary schools — Durant-Tuuri-Mott, Eisenhower and Potter — last year. The new model provides students with strong, research-based educational and enrichment opportunities, along with nutritional support, physical activity, mindfulness exercises and more. These are the types of interventions students need to mitigate the potential long-term effects of lead exposure. In addition, the schools will become the best place for students, their families and other community members to access a wide range of services. A community school coordinator will build relationships with school staff, students, their families and other residents of the neighborhood. The coordinator will listen to what those groups need and want and bring in community partners to help meet needs. A Genesee Health Plan health navigator will assess students’ health needs and work with different agencies, organizations and health care providers to address them. YouthQuest, which already provides free, high-quality afterschool programming at all Flint Community Schools, will continue to provide a fun, engaging and experiential approach to promote learning, well-being and leadership development. The program also will provide important ways for young people to get engaged in the community. Together, these efforts aim to drive progress toward four goals: improving students’ attendance at school; improving third grade reading levels; improving grade promotion and high school graduation rates; and encouraging community engagement.